The First Fall stories are united by the setting: they span a period from before humans arrived and the first few decades of settlement in the southern continent. Generally the stories are about the relocation and reorganization of the southern colony in response to the First Pass of the Red Star — an erratic planet that periodically brings a biological menace, in the form of falling thread. The twelfth Dragonriders of Pern book, First Fall shares its early setting only with one previously published book in the series, Dragonsdawn (1988). 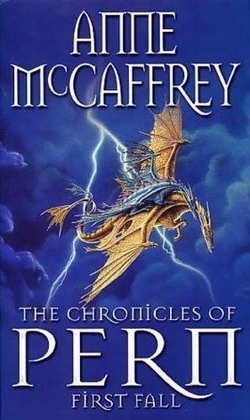 MacCaffrey places Dragonsdawn and First Fall in a perspective of the ancient history of Pern.